For the story behind Charlottesville’s most popular place to eat, click here. The quick guide to Bodo’s is below. 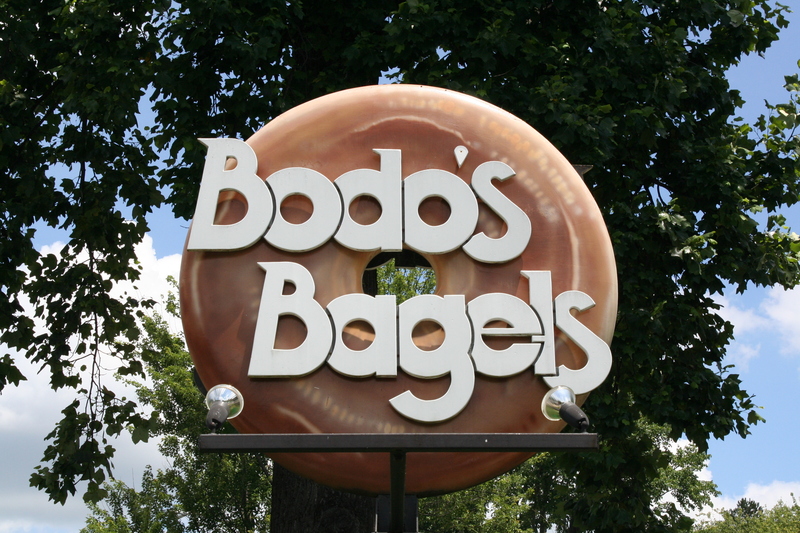 Bodo’s, a bagel bakery, may be Charlottesville’s signature restaurant. It has become so embedded in Charlottesville culture that it is now a Charlottesville institution to call Bodo’s a Charlottesville institution. Combined, Bodo’s three locations employ 120 area residents and feed roughly 6,000 people a day. Bodo’s popularity is partly because the bagels are great. And, cheap too. But, a bigger reason may be that the entire Bodo’s experience is so congruous with Charlottesville. Like Charlottesville itself, Bodo’s is a happy place to be. Given the breadth of the menu at Bodo’s, it seems silly to suggest specific items to order. There are infinite possible combinations. But, as longtime customers, we can offer a few ordering tips. First, when we order a sandwich, we almost always ask for it “cut in half.” We have yet to crack the mystery of why this makes the sandwich so much more appealing to us, but it does. Maybe it will work for you, too. Second, if we add condiments, we typically like to request “EZ” — as in “EZ Mayo” or “EZ Mustard.” This invariably provides a sufficient amount without going overboard. Beyond that, for specific sandwich suggestions, we decided to ask the experts, Bodo’s owners and staff, for their single favorite way to enjoy a Bodo’s bagel. The results are magnificent.